I hadn't realised it till last week, but one of the perks of this blogging caper is that people who are on more or less the same wavelength as you sometimes share their materials with you. 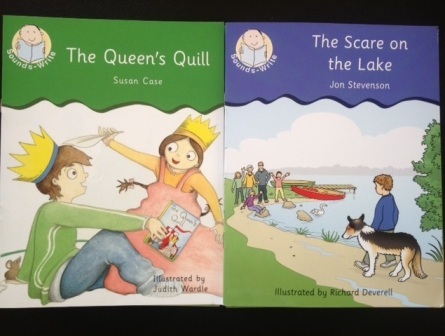 So last week I received a lovely bundle of decodable readers in the mail from Sounds~Write in the UK. Thanks, John! Sounds~Write is an evidence-based synthetic phonics program, with a focus on intensive training for teachers, thus providing them with the skills to teach synthetic phonics really well. The Australian National Inquiry into the Teaching of Literacy found that this was a significant gap in Australian teacher-training, so more programs such as Sounds~Write sound like just what the Inquiry ordered. You can find out most of the things I know about Sounds~Write from their website, so I won't paraphrase them, except to say that there is a Sounds Write trainer called Mary Gladstone in Lismore, NSW, with whom I have been playing phone tag today, she sounds very nice. The Dyslexia-SPELD Foundation in WA is also bringing Sounds~Write trainer John Walker out from the UK to run some training in Perth in early July 2013 – click here for details. I have no idea whether they still have spaces available, so sorry in advance if it's full or over-subscribed. Anyway, let me tell you about the nice little books that magically arrived in the snailmail. Sounds~Write starts off teaching children the following letters/sounds: a, i, m, s, t. They have two little books for learners to practice reading words containing these. You can't make a lot of words using only 5 letters, but they have a good crack at turning these into something readable and enjoyable. For example, Tim, Tam and Sam go to the park and play pranks on each other, putting water on the see-saw and getting each other to sit in it. The last laugh is on all of them when the gardener runs the hose over the swings, then they all sit down and get wet pants. Full marks for squeezing a story kids will like out of so few letters and some nice illustrations, I say. Next they work on consonant blends, first at word endings and then word beginnings, starting off with two-sound blends, then three-sound blends. The final part of what they call their Initial Code is the introduction of the digraphs sh, ch, th, ng and ck, with one book each. It looks like children in their first year of schooling cover all of this before Easter. Wow. As Liz Lemon would say, "I want to go there". Some synthetic phonics programs seem to introduce sounds and letters in little clumps, so they start off with s, a, t, p, i, n, and then move on to a second clump and a third, until they have covered the basics. However, I'd worry that my learners might forget the first clump while they were learning the third one, so I much prefer to use a cumulative approach, where a few letters are added at a time to the overall total, and the number of letters/sounds learners are using just expands over time. This also makes it easier to write interesting stories, and seems to be the Sounds~Write approach. After the Initial Code, Sounds~Write introduces the Extended Code, which is basically vowel spellings like 'ay' and 'ee' and 'or', and again each one has its own book. These books also introduce some multi-syllable words, which could be a bit tricky for some of the learners I work with. I prefer to introduce all the vowel spellings in one-syllable words before moving on to longer words. However Sounds~Write has some pretty heavyweight research behind it, so perhaps with mainstream learners this is less of an issue. If anyone wants to come and have a look at these books (either in person or via Skype, which I am definitely learning how to use properly in the next few weeks) before deciding whether to buy them, please let me know. These books are intended for younger children, and reflect themes that are mainly of interest to primary school aged children, so I probably won't use them with the teenagers I'm working with tomorrrow. However the Sounds~Write order form includes six books called Battle Cries for young adults. There just aren't enough books around for older, grumpy readers who don't want to read "kids' stuff", so these also go on my (far too long) wish list. This entry was posted in books, phonics activities, sound-letter links, teaching strategies on March 5, 2013 by alison. Just found this article whilst google searching different phonics programs. Such a useful synopsis of Sounds Write. There does still seem to be huge confusion about phonics and teaching of reading in general. I use several different programs including Sounds Write and also Letters and Sounds. The 6 sounds / s a t p i n/ comes from Jolly Phonics. The training I received in the UK from Letters and Sounds years ago advocated 4 sounds to begin with /s a t p/ and I have always used a cumulative approach not the clumps approach that you talk about. Always find your blog interesting and when in Melbourne – now in Perth referred several people to your great resources. My profuse apologies for overlooking your comment on my website for so long. All comments used to be emailed to me but they’ve stopped now and I don’t know why. John is coming here this year I think but I don’t know dates or where he will be. Just email him and ask! He is a very good presenter and nice fellow.